Have you heard of Wordle? It's a website where you input some text or link to a webpage and you get some art from what you entered. It's fun to spend some time there, playing with text. I first heard about it a couple of years ago during NaNoWriMo. I played; I forgot what it was called; I forgot about it. Periodically it surfaces in my brain and I try to remember how to get back to the site, since my bookmarks/favorites are so huge now and after changing computers due to blue screens of death and totally clogged systems I've even given up searching because it might not even be there, anyway. Then yesterday Wordle surfaced again. I've been thinking about it recently, wanting to play, but too busy to look into finding it again. 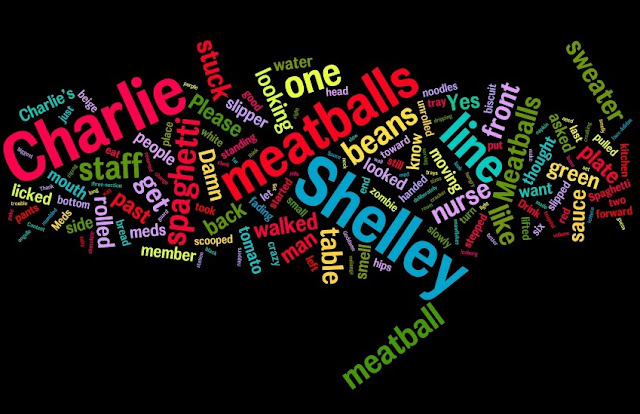 Then I received an email of a writer's blog post, which included her Wordle from one of her stories. Yay! I decided to enter the text of the short story I'm preparing to send out into the world. There's an upcoming deadline I want to make for an anthology.